It’s accounting season. Adrian’s assistant has prepared a summary of what our family spent last year on recovering Martin. Supplements, therapies, unreimbursed doctor bills, plane tickets to see specialists, that sort of stuff. It does not include expenses associated with Martin’s restricted diet, like buying only organic or making weekend farm visits for meat. Nor does it include my kitchen make-over, continually purging plastics and aluminum in favor of glass or stainless steel. Even without the foods and cookware, the total is a large number. Not astronomical. Not bank-breaking. But large. “Did you think it would be this much?” Adrian asked me. He seemed mildly offended that I’d asked the question. But I was on a roll. “So let’s keep it going,” I said. I examined the shoe. I got excited. “Samara, do you see this?” I asked. One more symptom of autism so far behind us that I don’t think about it anymore. Samara seemed less impressed. “But what about Martin landing on the outside of his foot?” she asked. It’s been a week, again. More than a week, without a post. I frustration posted last Tuesday, and then abandoned my readers. My own private cliffhanger. Let me assure you that Martin is fine. We’ve started his new supplementation protocol, we’ve had ups and downs, and I’m back to—my, um, usual sunny self. The blog dry spell occurred because I’ve been occupied with getting my business affairs in order. I’m not dying. Not as far as I know. Instead, I’ve quit my job. For nearly thirteen years, I’ve worked as an attorney for the same large law firm, and it’s a job I’ve always felt privileged to hold. I have talented co-workers who bring out my best efforts. I’ve been compensated well. Lawyer comprises a substantial part of my self-identification. It seems like I should say the decision to quit was difficult. My quitting strikes a blow to the family finances, but not a death knell. I am very, very fortunate to be able to make the choice, and grateful for Adrian’s career to facilitate my lack of one. We determined, together, that Martin’s recovery requires (at least for a while) a parent dedicated full-time to the task. In the past months there have been too many ASD articles unread, too many tests uncompleted, too many exercises undone. I’ve been exhausted and unable to keep up. That must change. It’s not that I am going to be unemployed. I’ve just stopped moonlighting as an attorney in order to concentrate on my day job, healing Martin—which is another job I will always feel privileged to hold. This will, of course, leave more time for blogging about healing Martin. Please expect more regular posts. Perhaps daily posts. Perhaps too many posts. If I go a little crazy with it, let me know. And so the next chapter opens. Months ago, when Martin was having more trouble sleeping—if you’ve been reading for a while, you may remember this—I would sometimes draft posts during those long midnight hours, sitting in his room with an iPad. To myself, I called it “exhaustion posting,” and I knew it wasn’t a good idea. When it’s 3:00 a.m. and I’ve slept eight hours during the past 72, it doesn’t matter how much progress we’ve made overall or how bright the future looks. I will have nothing nice to say. Why am I frustration posting when I know I shouldn’t? We’re in the dumps again. Crapsville. The Land of No Focus. The State of Bad Digestion. Obsession City. When Adrian and I returned from vacation last week, Martin’s symptoms were, I thought, more pronounced than when we’d left. I concocted several explanations—change in routine without school, anguish at wondering if his parents would return, a stale supplementation routine—that allowed for easy solutions. We’ve been home now six days. So far, the easy solutions have failed. (I’ll admit that I have not yet updated the supplementation. I have a call scheduled for Thursday to discuss that with Martin’s excellent Track Two doctor.) Martin’s belly is distended. He has diarrhea. He’s scratching. And the behavioral symptoms have become yet more pronounced. Getting Martin fed and ready for school this morning was like weaving a basket from cooked spaghetti. Nothing worked. He lacked the attention to put food in his mouth, absent constant nagging. He had no language to express what he sought and reverted instead to “You wan’ you wan’ you wan, I wan’ I wan’,” without object or variation. He refused to stand long enough to get his pants down for the toilet, or to don a jacket for the New York winter; when I tried to accomplish those tasks, he threw himself against me or fell to the floor. Adrian, who takes Martin down to meet the school bus, later reported that Martin had been unable to engage in even simple conversation like providing his teacher’s name. This evening was worse. Evenings used to be the most difficult part of my day, because as Martin grew tired, he grew unmanageable, even less able to read my signals or control himself. I thought those days were over. Today he arrived at 5:30 p.m. with a babysitter, utterly hyperactive, laughing without obvious reason, jumping on the sofa, darting from chair to stair to table. At 6:15, when the babysitter prepared to leave, Martin began screaming because she zipped her vest. That’s a special new highlight, this fixation on zippers. Once the poor sitter managed to escape, from 6:15 until bedtime was a near-unmitigated scream-and-cry fest, punctuated only by bites of dinner and senseless verbal demands. “You wan’ bath. You wan’ not bath. No. No. No. You wan’ counter. Mommy is coming back. She’s coming back. You wan’ go outside. Outside.” Every chance he got, he grabbed my cardigan and yanked the zipper down or pushed it up until it caught my hair or the skin of my neck. He left his plate and ran around. He slunk from chair to floor and refused to rise. When I finally got him into bed he tried to insist on wearing the tight winter vest over his pajamas. I probably should have indulged him. Instead I refused. Scream-and-cry fests diminish my empathy. Insofar as scream-and-cry fests are symptoms of something amiss within Martin, they should cause the opposite, i.e., a flood of empathy. In the world of reason, that would happen. In the world of frustration, it does not. So there you have it. The bad with the good. Right now I’m telling myself that we turned the tide in late November and early December, and that we can do so again now. Right now I’m hoping for a better day tomorrow. Right now I’m trying to breathe. We’re home, since Wednesday evening. We were overjoyed to see Martin, who seemed to share the emotion. He spent Wednesday evening running excitedly around the apartment, pointing alternately to me and Adrian, exclaiming, “That’s Mommy! That’s Daddy!” He showed off some new skills, too. He’s riding a bicycle, an upright model with training wheels that my mother puchased while we were away. Martin pushes the pedals and steers and calls, “Help! Help!” when he gets himself stuck. He’s also taking pills without assistance. If I hand him a capsule and ask him to swallow it, he pops the thing into his mouth and obliges. Pretty cool stuff. At the same time, I can’t deny that, in some areas, he’s “off.” I have to call his name several times to get a response. When he does finally answer, he maintains eye contact only briefly. He’s unfocused and difficult to control. He’s thrusting his lower jaw forward, grinding his teeth again. And he’s taken to wearing a too-small winter vest, even in the house. Even to bed. 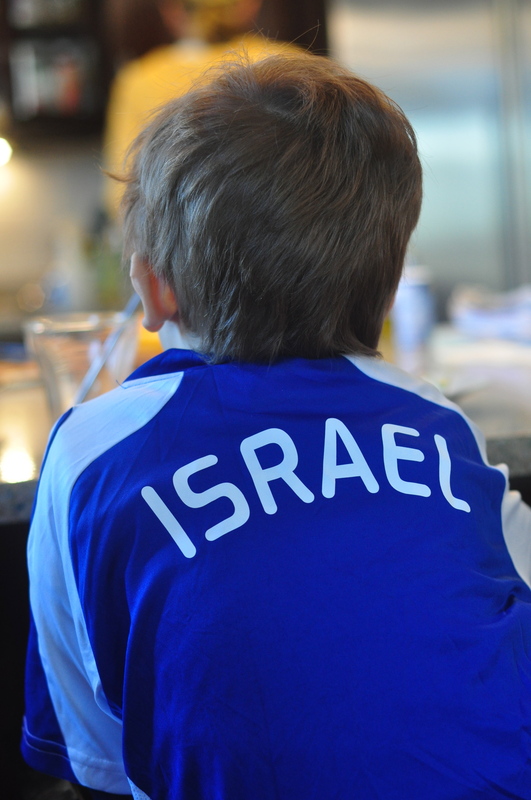 He started this while Adrian and I were in Israel. Samara speculates that he may have been associating the vest with us and therefore finding reassurance in it. I (being Debbie Downer, as I am prone to) suspect that its something more like the weighted vests often recommended for autistic kids, to help them feel secure when their senses are processing haphazardly. In any event, it’s a new behavior, and one with which we are not pleased. He just does not seem to be doing as well as before we left. I’m asking myself what all this means. Clearly, my mother did an outstanding job with Martin while Adrian and I were vacationing. She followed his supplement routine scrupulously, taught him to ride a bicycle, and generally loved the heck out of him. One of my brothers was here from Boston too, playing with Martin and—to needle me, his New Yorker sister—taking pictures of Martin in Red Sox apparel and posting them on Facebook. So inadequate care has nothing to do with Martin’s slight backslide. Other possibilities I’m considering are anxiety at not understanding when his parents would return; a stale supplementation routine (he’s due for some changes, which we were waiting to implement until after vacation); and the change in routine, i.e., lack of school for a week-and-a-half. I’ve promised repeatedly not to let the day-to-day ups and downs of the process get to me. But I do, of course. Yesterday, with Martin’s attention AWOL, I tripped and stumbled into the doldrums. I blamed myself, for being gone. I felt hopeless, for losing some of our great recent progress. I … whatever. There is no sense re-hashing a bad day. Samara works late on Fridays, so Adrian and I went grabbed dinner and went to see The Iron Lady. I fell asleep half an hour into the movie and woke to the closing credits. I felt better. Does this mean I’ll never go away again, until Martin is recovered? No, probably not. Adrian would never stand for that, anyway. He’s my sanity check. More likely it just means it will be a while. Now is the time to figure out what’s going on with my little man. Head up. Done with feeling sorry for myself. We go home tomorrow, Adrian and I. We’ve been away just over a week. I was determined to post every day this vacation, and except for yesterday, I managed. Yesterday we visited Yad Vashem, Israel’s center for Holocaust documentation, research, education and commemoration. What we saw there made my work with Martin feel almost petty by comparison. I took the night off from writing. Today I spent longing for Martin—his scent, his charm, his antics. Apart from the alarming reports of tantrums, news from home has been upbeat. Martin has slept through every night while we’ve been away, eaten well, and achieved some new proprioception milestones. He appeared happy to return to school this morning. He may understand that he’ll see me and Adrian tomorrow night. If we arrive home and find Martin in as good shape as we left him, I may loosen up a teeny-tiny bit. I may agree that others can manage Martin’s recovery needs, at least in short doses. Indeed, although Adrian doesn’t know yet (he will as soon as he reads this post), I have big plans involving him: If my mother could learn and accomplish Martin’s entire daily supplementation routine, Adrian can certainly master the morning routine. And if Adrian can manage the morning supplementation routine, then one weekend I can prepare Martin’s breakfast the night before, trust Adrian to administer the pills and oils, and sleep in. Yes, maybe I can sleep in. The dream is bold. We’ll see what tomorrow brings. 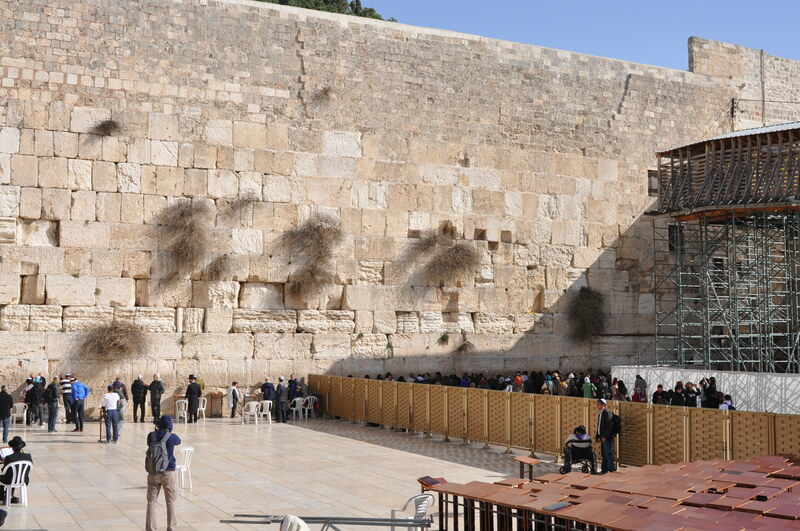 This afternoon in Jerusalem I tucked a slip of paper into the Western Wall. Scrawled on the paper was a prayer, for Martin to be healed. 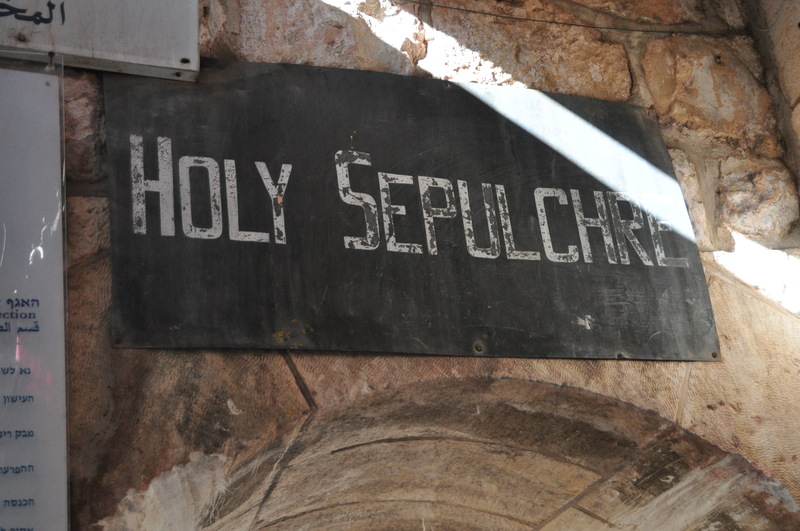 I made the same request, albeit in non-written form, at the Church of the Holy Sepulcher, the Chapel of the Ascension, the Church of All Nations, the Garden of Gethsemane, the Chapel of Dominus Flevit, and the Church of the Redeemer, where I attended Sunday worship. I’m the broken record of the prayer circuit. But hey, Martin’s the one on my mind. No upsetting messages arrived today from the home-front. Instead, Martin apparently walked on a foot-wide wall yesterday, while looking at his feet (hello, proprioceptive awareness! ), ate a big dinner, and then slept 13 hours soundly. From this morning my mother texted a picture of Martin building a three-foot-tall single-column tower of blocks (“Martin’s Eiffel Tower,” she called it), entirely unassisted. Earlier this year Martin had trouble stacking three blocks on top of each other, and possessed neither the focus not the coordination to achieve any more. 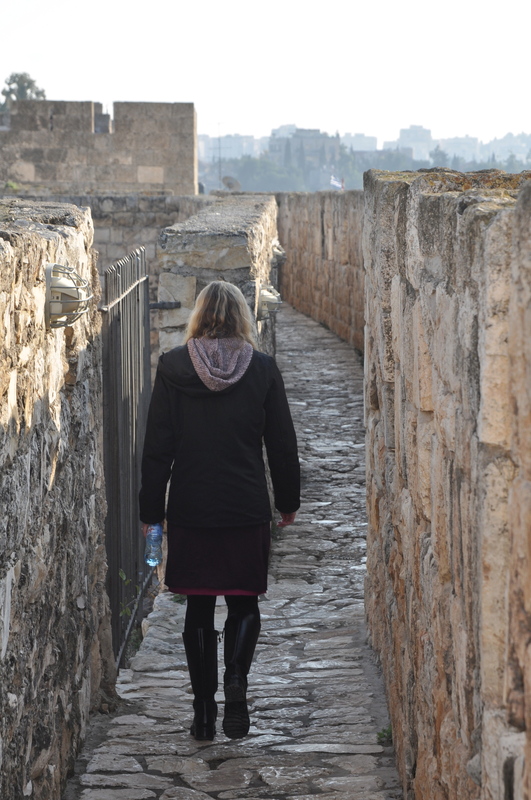 That’s the report from 1 January 2012 in Jerusalem. I hope this heralds a good year. A very good year.